When you prepare kale as much as I do, it’s necessary to get a little creative from time to time. Tonight I wanted something salty, sweet, and crunchy to go with the greens. I picked up the kale from the youth farmers’ market in my neighborhood on Washington Ave. Every Sunday afternoon a group of local teenagers pitch a tent and set up shop between Lafayette and Dekalb, selling plums, cherries, blueberries, apricots, kale, cucumber and apples (those last three would make a good juice by the way). The kale is only $2.50 a bunch so I bought some yesterday and made sure to use it this evening. I sautéed two cloves of garlic in olive oil for a minute or two then added the entire bunch of kale, washed and spun dry, and cut into bite-size leaves. 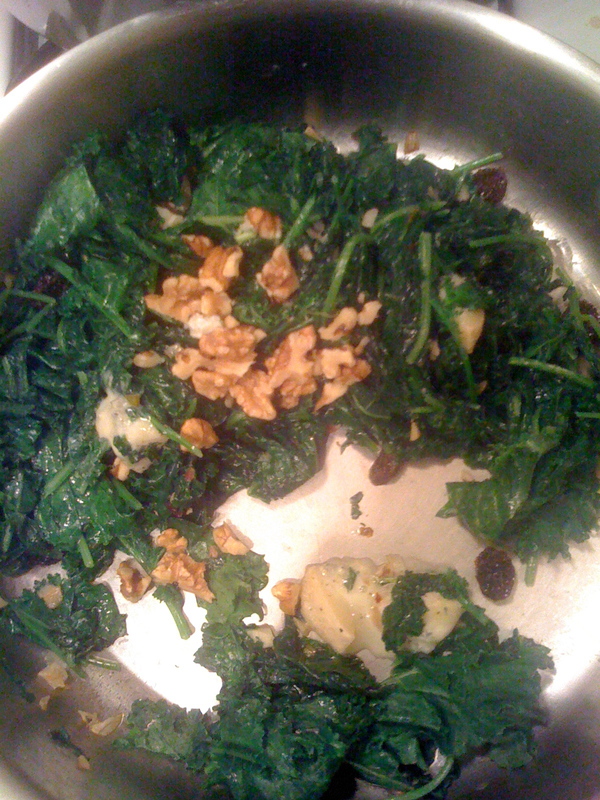 After sufficient wilting (3-4 minutes) in the pan, I added a handful of flame raisins, gorgonzola cheese, and walnuts. I let all that combine and cook for about another minute before serving. Oh and don’t forget the salt and pepper! This was a good accompaniment to the artichoke and olive ravioli I had. And I think both will be good cold or room temp tomorrow for lunch. 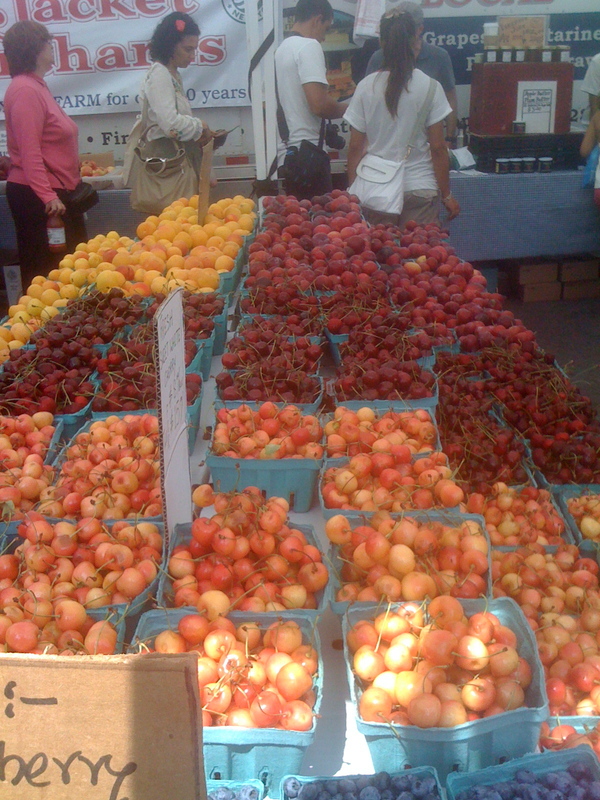 Below is a pic from today’s Greenmarket in Union Square, the Red Jacket Orchards booth. Shout out to the Finger Lakes! And welcome back Gabrielle Giffords! She returned to the floor of the House today to vote on the debt ceiling legislation. Giffords studied in the city planning department at Cornell, graduating just 3 years before I arrived in the same department. Anyway, I feel a connection with the Congresswoman and wish her all the best in her return.